Talking Pastel - TOP 10 Results for Price Compare - Talking Pastel Information for April 25, 2019. 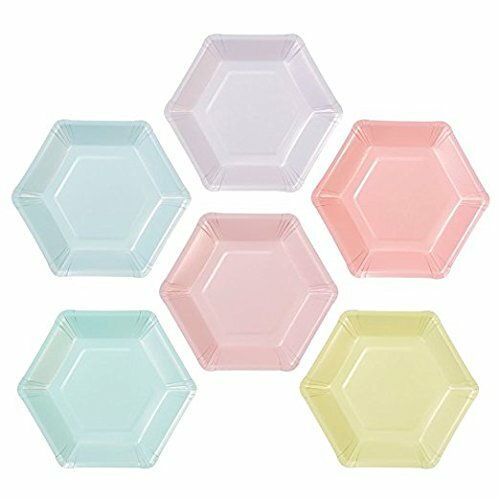 If you love the pastel trend as much as we do, then you'll definitely love these trendy hexagonal matte-pastel paper plates at your dinner party! Each pack contains 24 plates in assorted pastel colors, for a delightful touch to your celebration. Perfect for birthday parties, picnics, summer garden parties and more. It's pastel perfection! Mix and match with all the party ware you need in our We heart Pastels range, including iridescent pink cups and plates, and lovely watercolor napkins with foil detail. Delight your guests with these two divine floral designs. 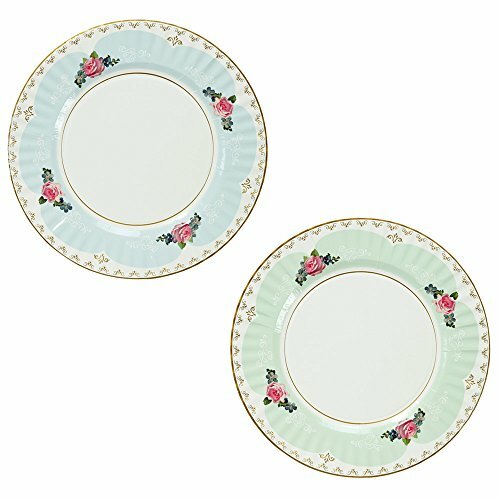 Stunning duck egg blue and pastel green floral designed large paper plates. Add the finishing touch to your party table. Each pack contains 8 paper plates and are the perfect size for hungry guests! Lay out your truly scrumptious snacks or treats on these simply elegant party plates for every occasion from birthdays to afternoon tea parties. These brilliant long birthday candles are a trendy alternative to your classic birthday candles. 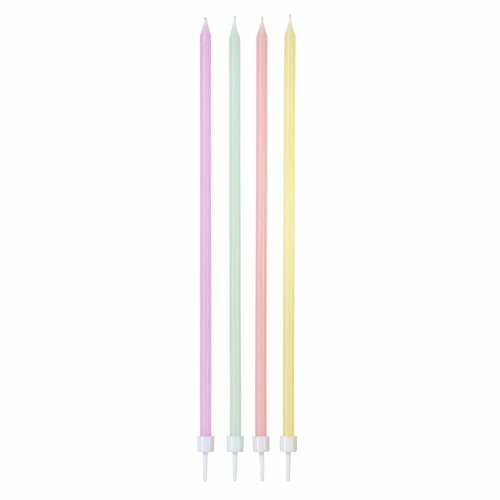 Featuring 4 different pastel colors, each pack contains 16 tall candles which will make your cake extra special this year. These candles also make a great gift to a friend with a birthday coming up! These pastel candles are a bright addition to our new We Heart Pastels range, part of our best-selling 'We Heart' umbrella range. Decorate your get-together with our pastel party pieces from the We Heart Pastel range. Perfect for any occasion, birthdays, showers, garden tea parties and others, it adds a delightful spring and summer touch to your celebration! Includes: 12 trendy hexagonal, beautiful matte-pastel paper plates! These plates are great for those party nibbles. 20 lovely pastel print napkins, great for afternoon tea, cocktails or canapes. 12 shimmer and shine pink cups. Add a sparkly touch to your occasion! Perfect tableware to add a splash of magical touch to your party. Satisfaction guaranteed or your money back. Add a dash of rainbow to your party with this giant foil balloon! This stunning colorful pastel balloon can be inflated with either helium or air, and is a whopping 80cm (31") in diameter. Each pack contains one rainbow balloon, an inflating straw and a piece of string 2 meters (6.5 feet) in length. Perfect for creating a wow factor at a birthday party, hen party or more! Mix and match with products from our 'We Heart' ranges for creating that pastel perfection. Shiny rainbow iridescent plates. 9 inch diameter. Pack of 24. Every room is better with a pastel glow! 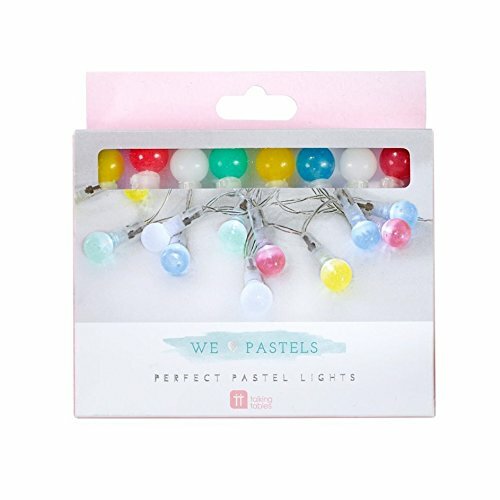 string up these gorgeous pastel Fairy lights around your home, or use as a table decoration at a birthday party. As part of our brand new we heart pastels range, these lights are entirely on-trend and look fabulous with other party pieces from the range. Each string of lights is 2.5M long and features 25 15mm pastel lights in Blue, Pink, Orange, white and Green. Aa batteries not included. 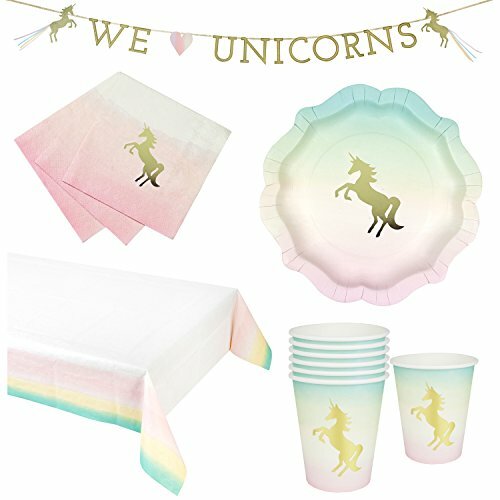 Our We Heart Unicorns Bundle are all the party pieces you need for a truly magical unicorn party. 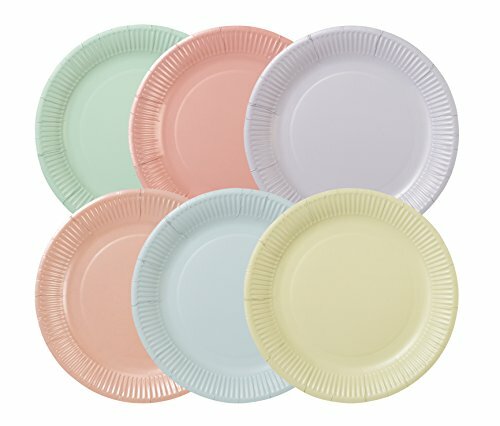 Pastel tableware perfect for a kids birthday party, a stylish christening, baby shower or even a colorful hen do! Includes: 12 pretty pastel party plates with a shiny gold foil unicorn detail! These plates are perfect for nibbles. 12 pretty pastel party cups with a shiny gold foil unicorn detail 16 stunning pink and gold unicorn napkins, featuring the phrase "I Believe" on the revere for an added touch of magic. 1 pink ombre paper table cover to lay on your table. 1 gold and pink "We Heart Unicorns" banner. Featuring 13 pennants across 10ft of garland. Perfect to add a splash of magical unicorn delight to your party. 100% Satisfaction Guarantee - If you are not completely satisfied with these items, we will refund your money. 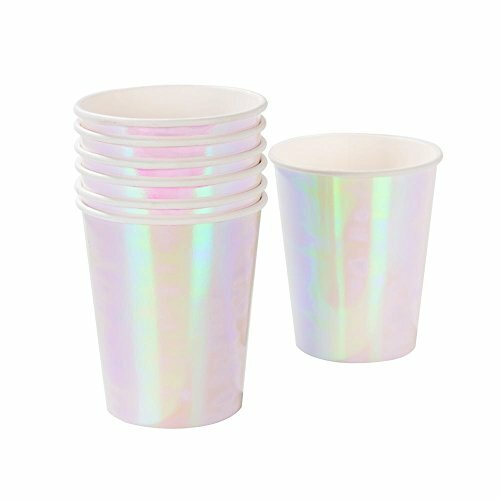 Shimmer and shine with these stunning on-trend iridescent pastel-pink paper cups. These cups come in packs of 24 and are a shining addition to our new We Heart Pastels range, part of our best-selling 'We Heart' umbrella range. Perfect for any occasion! 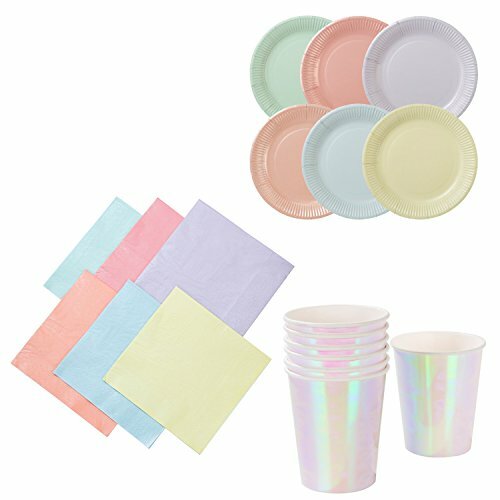 Decorate your get-together with other party pieces from the We Heart Pastel range, including iridescent pink and plates, and lovely watercolor pastel napkins with foil detail. 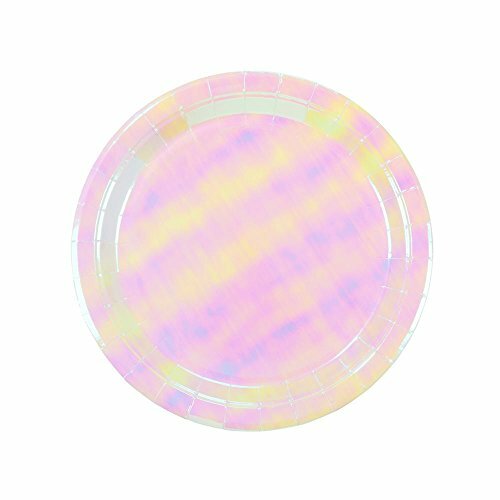 These stylish pastel paper plates go perfectly at any occasion! each pack contains 12 plates in 6 different colours (2X each) and will set a trendy colourful scene at a birthday party, Hen do and more! mix and match with our we heart pastels range for the ultimate pastel party!. Don't satisfied with search results? Try to more related search from users who also looking for Talking Pastel: Pleated Chino, Under Drawer Slides, Sea Salt Baking Soda Bath, Symbol Crochet Doilies, Wood Whistle. Talking Pastel - Video Review.